Limited Time Offer - only $19.95! From the outset of the war in Iraq, Stars and Stripes reporters have been on the ground covering the conflict. 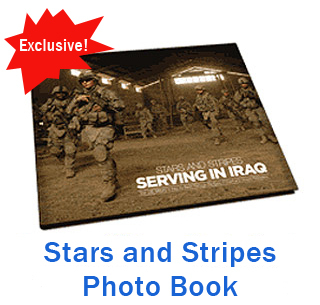 "Serving in Iraq" is a limited edition hard-bound book that takes an intimate look at the U.S. military experience in Iraq. Drawing from the first five years of war, the book is filled with images only a reporter embedded with U.S. service members could possibly capture. 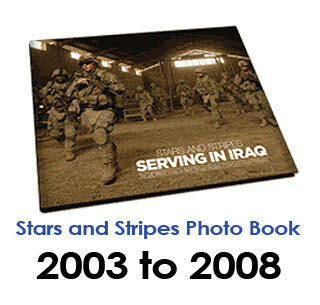 As the primary source of independent news coverage for the U.S. military community, Stripes reporters were there from the very beginning of the conflict, documenting the courage and dedication of the men and women who serve in uniform and those who anxiously await their return. This must-have commemorative makes a handsome, one-of-a-kind gift -- and it's not available anywhere but online. Plus, we ship APO/FPO!